My sister belongs to a guild where she meets up and stitches with like-minded women. She spends many hours constructing quilt blocks, choosing colours and patterns, and quietly drawing thread through fabric until an entire mosaic is brought forth. 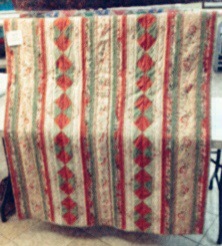 The quilters in her group often help each other with problem pieces — or with quilts that just need some finishing. I love the social aspect of this craft, which is the same as it’s been for the past two hundred years in America, when women met, sewed, talked and shared their burdens and their talents. 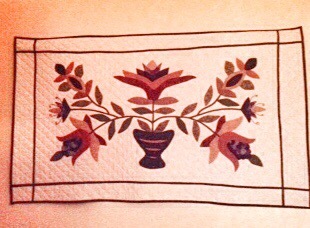 Quilting was born out of necessity and austerity but has grown into a beautiful art form of (mostly) women’s handicraft. What a wonderful heirloom she has gifted me and others. Oh, oh, oh – I am salivating all over my iPad here! 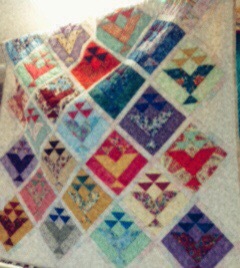 Quilting is such a magnificent art and I admire no end the people who get to practice it. You’re both very lucky. Wow. Thank you. I, too, think quilting is extraordinary. I’m not so good with the needle and thread. I understand completely. I started to write about my problems with iron on hemming tape. I can’t even cut fabric in a straight line!!! You are very kind. And I’m sure she would gladly bring you to one of her epic retreats where you will learn the craft. She insists that we could do it! Wow. Beautiful work. How lovely what she does. The kindness of her being and her generosity shines through in her work. What talented siblings you are! Thank you, Carol. We do have a little exchange going on– she gives me quilts for my beds and table covers for my holiday decorations and I give her earrings and necklaces to wear. It works really well.